It seems to me that somewhere in time the gospel became watered down. The concern became more about “saving” others and less about personal relationship and accountability. Focusing on others, and not ourselves, brings on judgement, condemnation, argumentation-all while the log exists in our own eye. Raising children in a world where civil law mirrors scriptural morality less and less is difficult. It doesn’t matter if you are talking about adultery, homosexuality, murder, slander, stealing, etc… The list is endless. Why? Because we are sinners. We live in a fallen world and each and every one has opportunity to make one single decision-the decision that changes everything. Yet living in a world where social and civil law are far from biblical morality should be no surprise. Scripture tells us about this world. This world has always existed-a depraved and fallen world. There is no doubt social media and network television amplify it, making us acutely aware, but it has always existed. 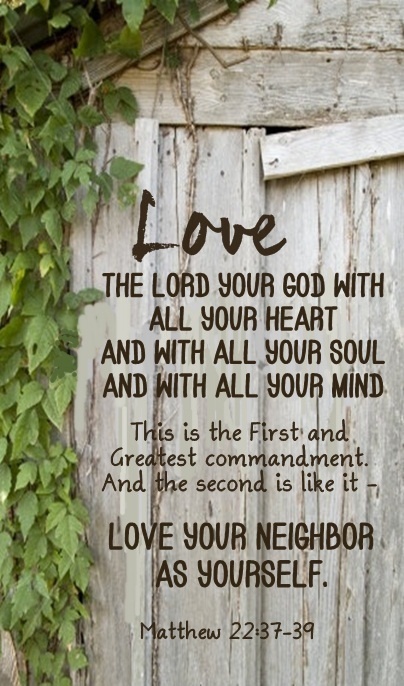 I am to first and foremost love God with my entire being. My relationship with Him matters most. Am I following His commands? Am I working to become more like Him each day? Am I mindful of my own sin and seeking forgiveness and wisdom to change? Those things matter most. Out of a right relationship with God flows the ability to love others. I am not equipped to love them as He does. I am not judge. I am not forgiver. I am not savior. I can only love them as I love myself, which pales in comparison to the love He extends. I can only share with others what I know of Him. I can only share with others what I have experienced of Him. It is not a love that loves with abandon. I do not love myself with abandon. Like you, I am my biggest critic, and rightfully so. If I am seeking to love God with all my heart, soul and mind, then I am seeking daily to shine the light on my own sin, to determine where I need to grow. Most importantly though, it means my compass is His word, my standard for morality is not civil law or social law, but His law. Today, my job as a wife, mother, friend, neighbor is to make certain my children and those around me know God’s word. My job is to encourage them and equip them to desire to know more about Him and to experience more of Him every day. My job is to remind them that we live in this world, but our home is in Heaven. I am to teach them to put on the Armor of God. (Ephesians 6: 10-18) I am to equip them to “live carefully-not as unwise but as wise, making the most of every opportunity, because the days are evil. Therefore do not be foolish, but understand what the Lord’s will is.” (Ephesians 5: 15-17) This scripture is often used as a scripture reference by pastor’s exhorting us to make the most of every opportunity to witness, to go and share the gospel. That is not what this scripture is saying. This scripture is reminding us to be careful, to realize the dangerous condition(s) we have or are slipping into. It is a reminder to keep our standards high, to live according to God’s word. Must we witness? Yes. In no way am I seeking to minimize or belittle our responsibility to share our faith. However, if our eyes are so focused outward that we fail to see the depravity of our own lives, what good is our witness? What if I focused more on HOW I lived being my witness and relied less on my mouth, my fingers posting to social media? Coming to know Christ as your personal savior is a simple act of faith. He requires absolutely nothing of you. We must simply acknowledge one true God, who sent His one and only Son, Jesus, to live amidst humanity, and after being rejected by most, died on a cross that we might ALL have forgiveness. He will always be rejected by many. Yet, His blood still covers the sins of anyone desiring to know Him, follow His commands and live according to His ways. I don’t agree with many, many things within our civil law. I am thankful I am not of this world, but am of Christ. I choose today to hold myself accountable, to speak truth to those with whom I have contact. I will seek daily to be careful, to put on the armor of God. I will train my children to do the same. I will pray my actions are a testament to Him. I will leave the judging to Him, Jesus Christ, who sits at the right hand of God. I will not accept into my life anything that is not in accordance with His word, His will. I will remember daily I am not perfect, I am a sinner, I am nothing without the shed blood of my Savior Jesus Christ. I will remember His love for me cost Him everything. I will remember that He can not look upon sin. I will remember He loves us enough to give us a choice-a choice to believe in Him, the one true God, to accept the Bible as the incarnate Word of God, complete and lacking in nothing, or to reject Him. I will remember I am accountable for my actions, my words and no one else’s. I will grieve for those who choose to reject Him and I will encourage and love those who accept Him. I will live in accordance to civil law while on this earth, but I will live according to His word only.